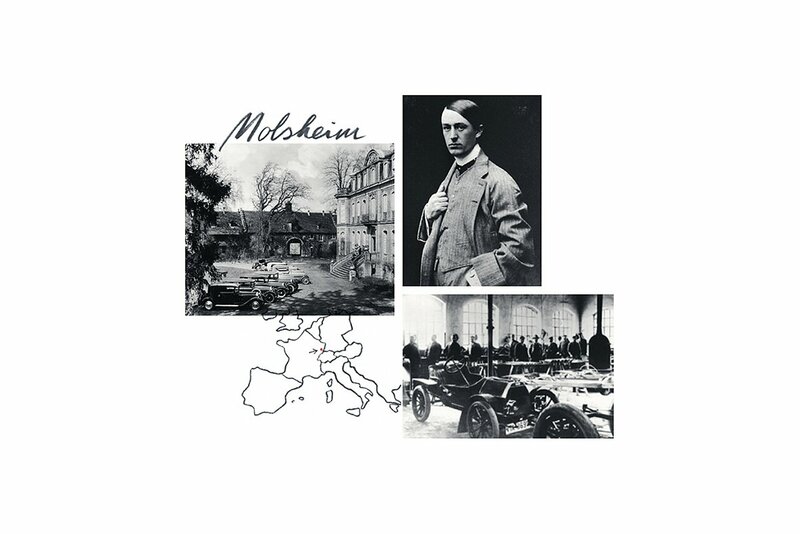 Molsheim is the home of the Bugatti family, the birthplace of the brand and the modern headquarters of the company. Located in France – in the heart of Alsace – Molsheim is where Bugatti’s long history of success began in 1909 when it started making cars that caused an absolute sensation. This was where the brand values of art, form and technology were born; values which endure to this day. Ettore Bugatti was a true gentleman of his day, cultivating personal relationships with many – if not all – of his customers. Today, we are proud to be continuing the Bugatti tradition in the place where it began, here in Molsheim – just as its founder would have wanted. The value of an automotive brand lies not just in its technical and stylistic finesse, but also in its tradition. That was why it was an obvious choice to revive the Bugatti brand in Molsheim, the original location of Ettore Bugatti’s legendary factory. This is where your unique Molsheim journey begins. You can experience the amazing interplay of art, craftsmanship and passion. Château St. Jean was certainly a unique location for a car factory. The picturesque grounds with free-roaming deer look like the backdrop for a film in which the distant past has been brought back to life. Nowadays, the château houses an exhibition of the brand’s history. Visitors are introduced to the brand’s past and its place in art history. All the uniquely talented figures of Bugatti history – Carlo, Rembrandt, Ettore and Jean – had a deep respect for the meticulous craftsmanship that remains at the heart of Bugatti’s core values to this day. Here in Molsheim, we are proud to own some of the rarest, most elegant and most beautiful cars in motoring history, and to be able to show them to the world. As the images of ox and horse heads that still adorn its exterior suggest, when Remise Nord was built in 1853 it was used for stables. The architectural style with wooden pillars was completely atypical for the Alsace region. Nowadays, Remise Nord is where the Bugatti customer service team is based. The team does everything in their power to provide Bugatti owners with the best possible service. In addition to the workshop in Molsheim, there is a team of “flying doctors” who are responsible for servicing cars throughout the world and ensuring they retain their value. The orangery is the only building that Ettore Bugatti added to the complex during his lifetime. Originally built to house tropical plants, it is now one of the highlights for visitors. In 2009, the orangery was renovated to mark the centenary of the founding of Bugatti. The 1920s steel structure was carefully restored to provide our customers with an authentic glimpse into Bugatti’s rich history. The factory, known as the Atelier, is the only modern building on the grounds. Essentially, the factory looks more like an artist’s Atelier. This is where our master craftspeople assemble each Chiron, Chiron Sport, Divo by hand. They work with a precision and attention to detail normally associated with master jewellers or watchmakers. When it comes to superlative automotive craftsmanship, nowhere can rival the Bugatti Atelier. The Atelier, which from a bird’s eye perspective resembles the famous Bugatti macaron, is an architectural statement that Ettore would certainly have endorsed. Remise Sud is the oldest building on the Bugatti grounds. Built around 1788, it was used for both stables and living quarters. Nowadays, Remise Sud houses the Bugatti library and the Bugatti customer lounge. Every Bugatti is as unique as its owner. Thanks to a wide range of customisation options, like those featured in “La Maison Pur Sang”, every customer can choose not just from different colour combinations but also from different colour layouts. Assisted by a car designer, the Bugatti customer can configure a Bugatti that is specially tailored to their preferences. Bugatti does not just represent top technology and breathtaking performance, but also art, design and an elevated lifestyle. The atmosphere, combination and variety convey a truly individual experience that is tailored to the individual customer.